From the South: Follow I-495 N. Take exit 30 for MA-2A W/MA-110 W toward Littleton/Ayer. Continue on MA-110 W/MA-2A W. Drive to Westford Road in Ayer. Turn left onto MA-110W/MA-2A W/King Street. Turn right onto Willow Road. Turn right onto Westford Road. From the North: From US-3 S take exit 34 toward Tyngsboro. Take Tyngsboro Rd, MA-40 W, N Main St and MA-225 to Westford Rd in Ayer. Take Use the right 2 lanes to turn right onto Westford Rd. Continue onto Swan Rd, then continue onto Tyngsboro Rd, then turn right onto MA-40 W. Slight left onto North St. (signs for Forge Village). Slight right onto N Main Street. Slight left to stay on N Main Street. Continue onto E Prescott St, turn right onto MA-225 W, continue straight onto Sandy Pond Road. Continue onto Westford Road. The Boston location serves Massachusetts, Connecticut, Rhode Island, New Hampshire, Vermont and Maine. 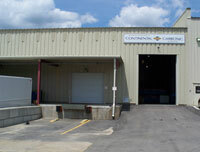 Continental Carbonic Products, Inc. in Boston, MA is one of 46 locations in the U.S. and Canada where you can buy dry ice in both cut block and pellet form. Continental Carbonic offers the highest quality, food grade dry ice in the industry.